Summer officially turns to fall today (Sept. 22), with the arrival of the autumnal equinox, marking the time of year when day and night are of equal length. Soon, the days will start getting shorter and the nights longer as we head deeper into autumn in the Northern Hemisphere, building toward the longest night of the year on December 21, the winter solstice. Today's equinox officially happened at 10:49 a.m. EDT (1449 GMT). This is the point when the sun arrives at the intersection of the ecliptic (an imaginary line marking the sun's path across the sky) and the celestial equator (Earth's equator projected onto the sky). 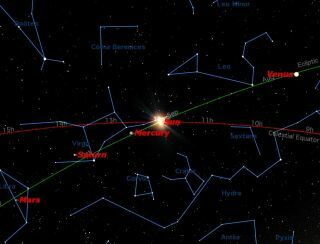 Today the sun appears to cross this equator, moving from north to south in the area of the constellation Virgo. Autumnal equinox usually heralds many good things in North America, such as red leaves, apple pie, warm scarves, and pumpkins. But there's another reason to celebrate today's seasonal change: it means a better chance of seeing the aurora borealis, or Northern Lights. That's because geomagnetic storms, which are disturbances in Earth's magnetic field, are more common in spring and fall than in summer and winter. And such disturbances often cause gorgeous displays of the aurora, which are created when charged particles from the sun slam into our planet's magnetic field. Earth's four seasons — winter, spring, summer and fall — are demarcated by equinoxes and solstices. After the winter solstice on Dec. 21, the next season change will come with the spring, or vernal, equinox on March 20, 2013, and then the summer solstice on June 21, 2013. Finally, we'll come full circle one year from now, with the next autumnal equinox on Sept. 22, 2013. These seasons, and all the equinoxes and solstices, are caused because Earth's axis is titled 23 1/2 degrees from vertical. That means that the Northern and Southern hemispheres usually don't receive the same amount of sunlight — except during the equinoxes.